GE MICRO KITCHEN The Micro Kitchen is a full appliance suite that fits into six linear feet, all under the counter. Three 24” modules that handle the tasks of cooking, cooling and cleaning. Designed to blend seamlessly into compact settings, the micro kitchen delivers the power of full sized appliances in a pint-sized package. All appliances are housed in drawers including a microwave oven, conventional oven, convertible refrigerator and freezer, dishwasher and an induction cooktop. 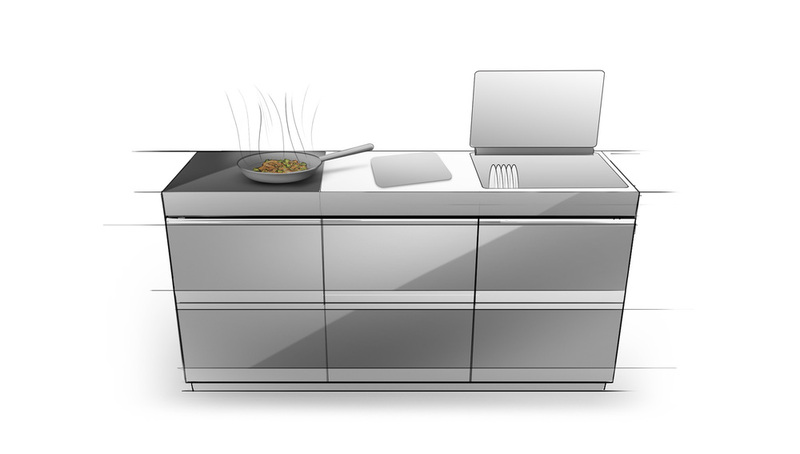 A downdraft hood and kitchen sink with disposal complete the full kitchen experience. The micro kitchen integrates into your choice of cabinetry, so the design possibilities are endless. URBANIZATION We recognized early on that urbanization was on the rise in the US like never before. The primary driver were Millennials seeking to live at the urban core. Millennials are distinctly unique in that they are more willing to swap mortgages and live in the suburbs for rentals at the urban core, they are generally more mobile and flexible in employment, and are marrying and having children later. SMALLER, BUT SMARTER A traditional complete kitchen simply doesn’t fit within a small space. Our goal then was to include a complete kitchen in the most compact form possible. One of the things we learned of the kitchens we visited in Asia was making the space feel much bigger by keeping it as low as possible, therefore, we felt all under counter was best. INTEGRATED TECHNOLOGY One of the foundations of the Micro Kitchen was a complete look at how appliance interact with their environment and how it could reflect modern ways of cooking. Countdown displays were integrated into the front of the counter top to show timers, temperature, and critical info at a glance from the couch. Many cooks today are referencing online recipes in preparation for their meals and in the back splash was an integrated spot for tablets and phones. CUSTOMIZATION The range of home decor is endless. All of the finishes on the door fronts, hardware, countertop, and metal work can be customized to complement the interior furnishings. IN HOME INSIGHTS Once we understood the significance of urbanization in the US, the team visited China, Korea, and Japan to better understand how these cultures have been refining this lifestyle for decades. Once surprising discovery on this journey was to notice how their needs in the kitchen vary from a typical user in the US. In the homes we visited, tile back splashes were an absolute must when cooking heavily with oils. MULTI USE Whether new or existing construction, the design has to be compact enough to fit in odd spaces, but large enough to house the necessary appliances. The micro kitchen was inspired by a furniture and cabinetry based approach, with the ability to change cabinet fronts and hardware.